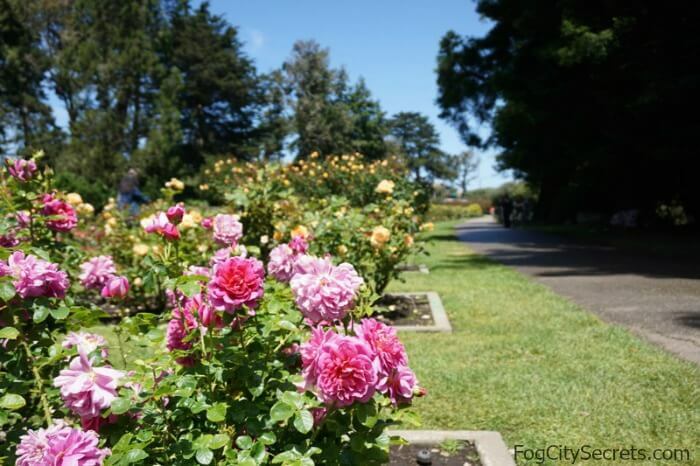 Gardens in Golden Gate Park: roses, redwoods, Shakespeare and more. Golden Gate Park has all sorts of pretty gardens hidden here and there for visitors to discover. Each garden has a special focus, and provides a calm and beautiful space to unwind. I've made a list of the gardens and placed them on a map, along with the best times to visit. There is another nice garden worth visiting at the western edge of the park (that didn't fit on the map), Queen Wilhelmina's Tulip Garden, by the Dutch Windmill on JFK Drive, just before it exits the park near the ocean. The Dutch Windmill was built in 1902 and used to pump irrigation water for the park when in was being transformed from sand dunes. This is a pretty garden any time of year, but spectacular in early spring (February & March) when a sea of brightly colored tulips blooms at the base of the windmill. The windmill fell into disrepair and stood as a ruin for many years, until it was restored a few years ago. Now it's merely decorative, but the sails go around. It was a gift from Queen Wilhelmina of the Netherlands; she reigned as queen from 1890 to 1948, through both World Wars. 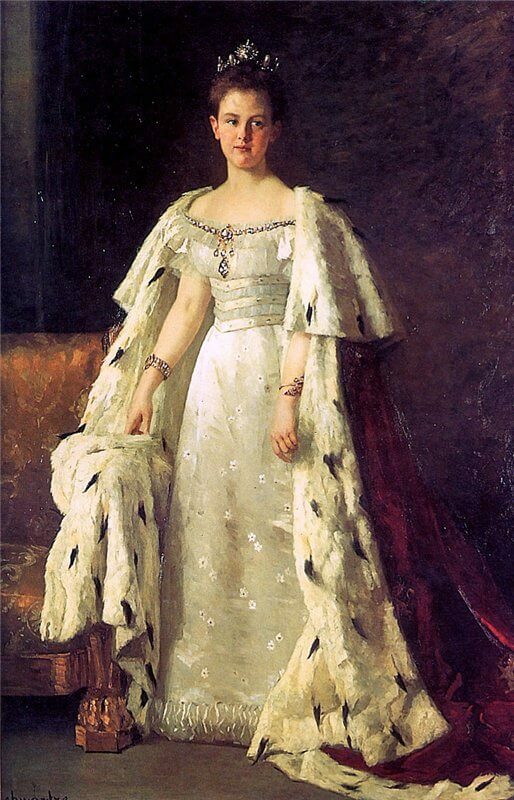 The painting is Queen Wilhelmina in her coronation robes. She became queen at the age of 10 and began ruling at 18. 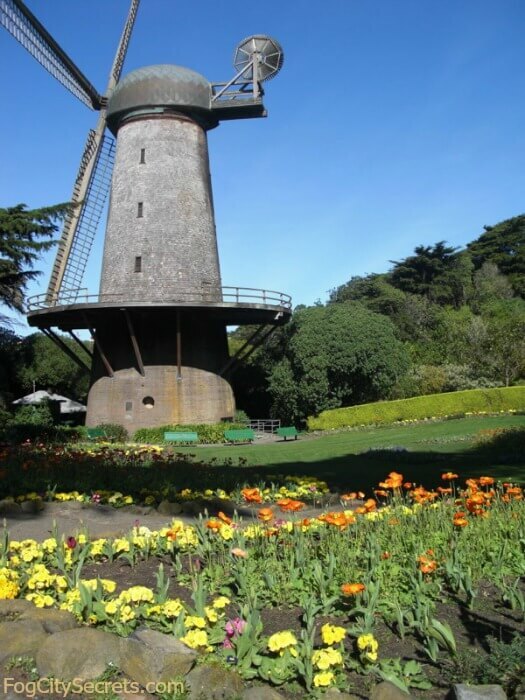 The other Golden Gate Park windmill is Murphy Windmill, on Martin Luther King Drive, also at western end of the park. This sweet-smelling garden is right behind the deYoung Museum on JFK Drive, but it doesn't stand out much from the main road. There are 60 beds of roses, surrounded by lawn, well-maintained in part by a group of volunteers. 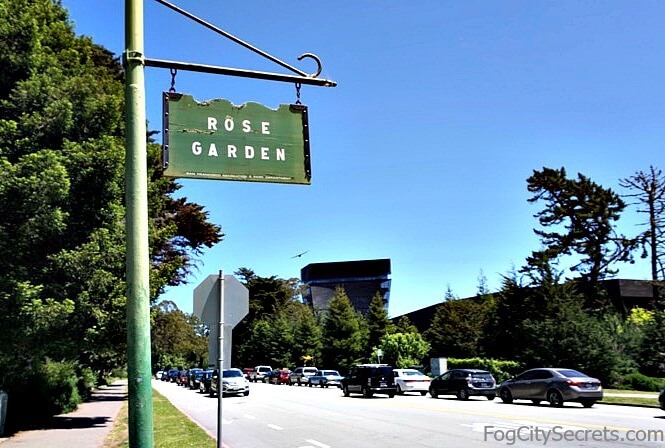 The rose beds stretch all the way to Fulton Street on the edge of the park. A gorgeous range of colors when the roses are in bloom, with many hybrids, miniatures and climbing varieties on display. There are benches to sit on to rest and admire the flowers. Most of the roses are labeled. The names are delicious as well: Cherry Parfait, Honey Perfume, Dream Come True, Rainbow Sorbet, etc. Best time to see the blooms: Mid-May through July, with another burst in September. 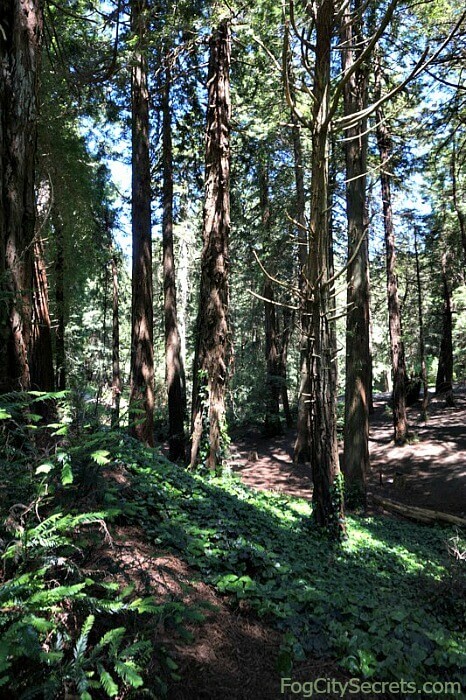 Right next to the Rose Garden (east side) is the quiet and shady Redwood Grove (with no sign). You can walk the dim paths through the giant Coast Redwoods, and come out right by the deYoung Museum. These aren't ancient like the ones in Muir Woods, only a hundred years old or so, but they give you a taste of the majestic trees. The entrance is on JFK Drive, across the street from the rear of the museum, or you can enter from the Rose Garden next door. Want to see the 1000-year-old ones? Check out Muir Woods. This wonderful garden is on Hagiwara Tea Garden Drive, next door to the deYoung Museum. Entrance is near the Band Shell on the Music Concourse. 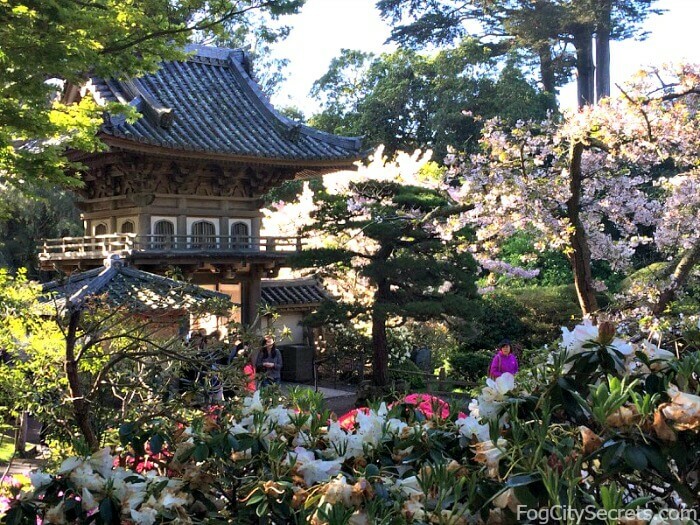 There are five acres of traditional Japanese gardens to explore, with pagodas, koi ponds and an arched moon bridge, plus a rustic tea house serving Japanese treats. Best time to visit? Cherry blossom time, usually mid March to mid April. See my page on the Tea Garden and Tea House for more information. Why Shakespeare? Alice Eastwood, a botanist with the Academy of Sciences, wanted to create a garden with examples of flowers and plants mentioned in in Shakespeare's plays and sonnets. The garden was built in 1928 and contains a bust of the Bard, along with six bronze panels engraved with quotes from his works. Two of the plaques have been stolen, but four remain, containing over 50 Shakespeare quotations relating to plants. Shakespeare's bust used to be kept in a locked box to prevent theft, but he's out in the open now and there's no sign of the box. The garden is entered through a whimsical arched gate made of leafy metal vines. There are benches for sitting, and a sundial stands in the center pathway. They say there are 200 of the mentioned plants here, but the plants aren't labeled, so bring a botanist along! A popular venue for weddings. It's right next to the California Academy of Sciences (west side) in a very busy area, but not well-marked, so not easy to find unless you know it's there. 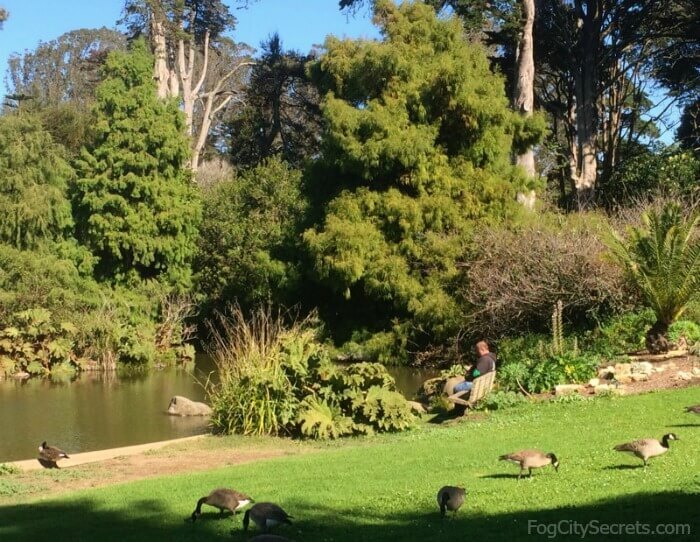 San Francisco's Botanical Garden, or the Arboretum, is located in Golden Gate Park. You can explore 55 acres of plants representing a variety of climates. Explore the succulent garden, the prehistoric plant garden and the moon-viewing garden, along with many others. See my page and tips on visiting, plus what's blooming when, at the Botanical Garden. 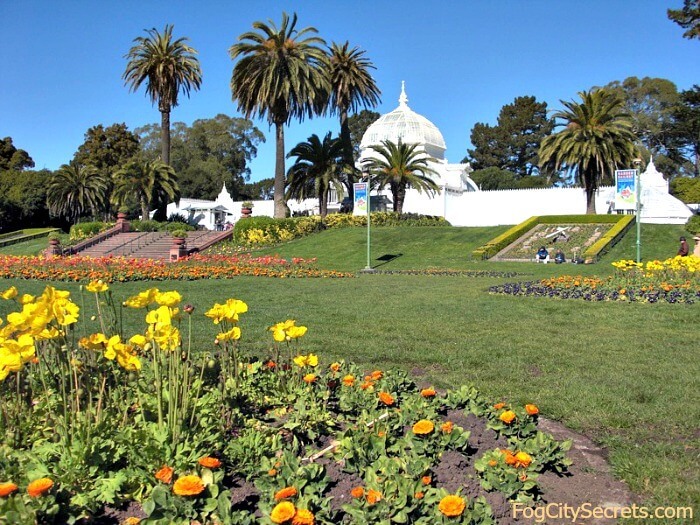 The broad area in front of the Conservatory of Flowers is planted with annuals in geometric patterns a couple of times a year. Quite a show! Visit the Conservatory itself for an interesting collection of rainforest and tropical highland plants, plus gorgeous orchids, and the giant lily pond with carnivorous plants hanging around it. They have cool exhibits in one wing once or twice a year, often involving model railways. 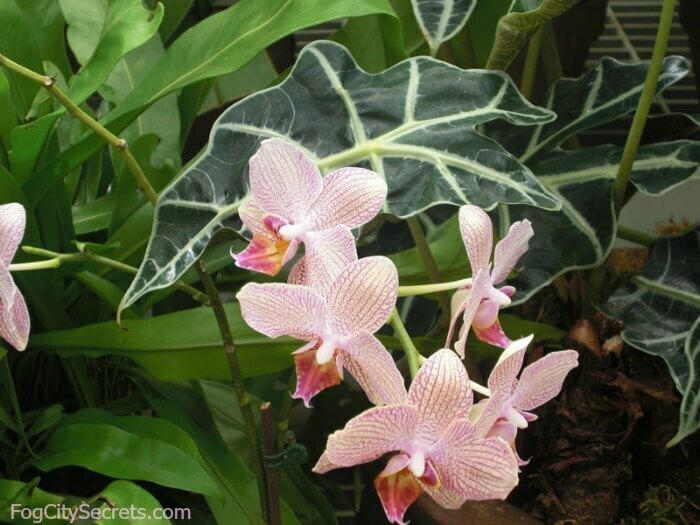 For more info, see my page on the Conservatory of Flowers. Best time for the flowers: the annuals in front of the Conservatory bloom in January until late April, then again late June through September. Best in August. This is a compact little garden just east of the Conservatory of Flowers which is an amazing spectacle when the dahlias are in bloom. 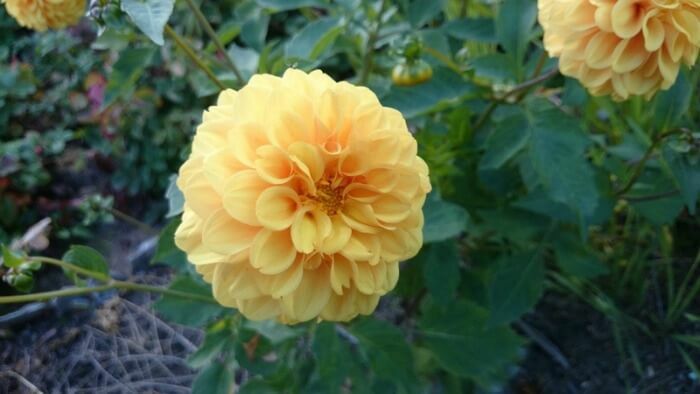 The dahlia is the official flower of San Francisco. There is one picnic table in the dell and you can actually reserve it. Best time to see them: June through October, but prettiest in August and September. This garden is tucked into the trees just to the east of the Academy of Sciences. Not as impressive as the rhododendrons of the Pacific Northwest, but pretty enough. There's a path that circles through it, and a statue of park designer John McLaren is there to greet you. This garden has had a hard life. 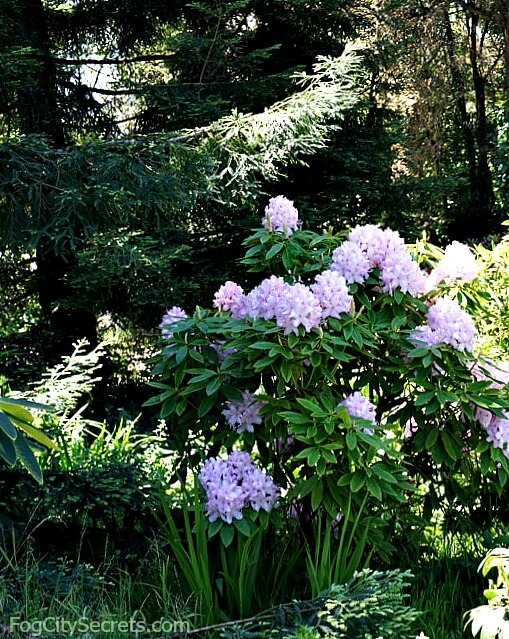 The climate isn't ideal for rhododendrons, too much wind and sun, and the plants have been struggling since the dell was created in the 1950's. Many of the bushes died in the fierce wind storms of 1995, but the space was redone in 2010 and now the rhododendrons are doing much better. You'll notice quite a few rhododendrons scattered all through Golden Gate Park, but it's a treat to see them all clustered together here when they're blooming. Best time for flowers: March and possibly April. These delicate flowers are found growing around a meadow with a sundial in the middle: "Amidst the Flowers I Tell the Hours". The sundial was 30 minutes fast, but so what? 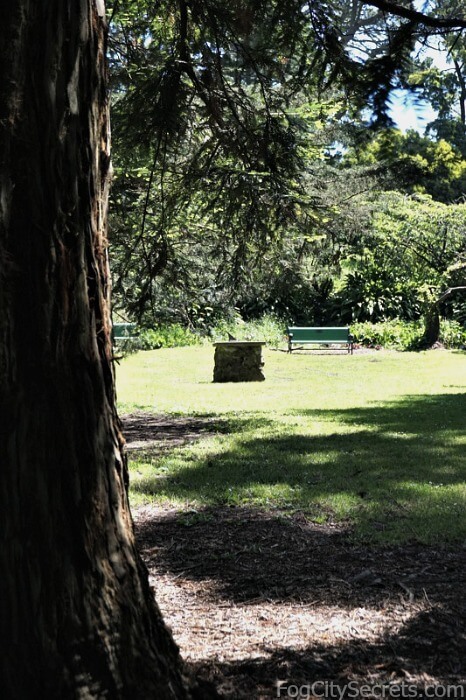 There are woodland paths to follow through the dell, and benches placed for resting. The Fuchsia Dell was created in 1940 and is a favorite hangout for hummingbirds. This main entrance to the garden is east of the Conservatory on Conservatory Drive, but there's a short cut through the meadow on JFK next to the Conservatory. Best time to see the fuchsias: May through October. 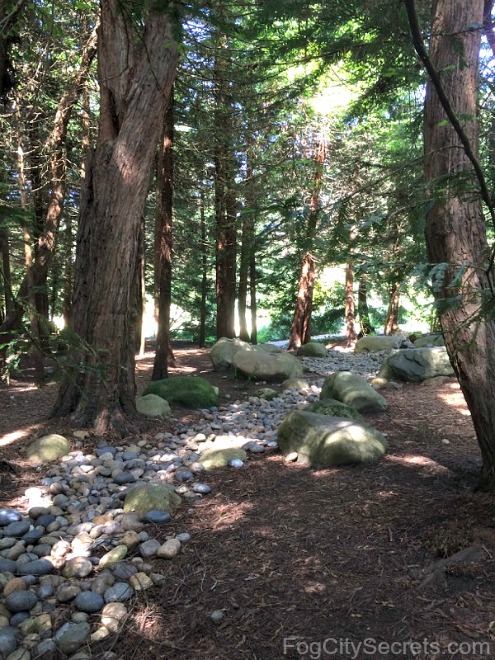 There's another shady and peaceful redwood grove is just a short distance west of the Rose Garden on JFK Drive. It's rather hard to find. 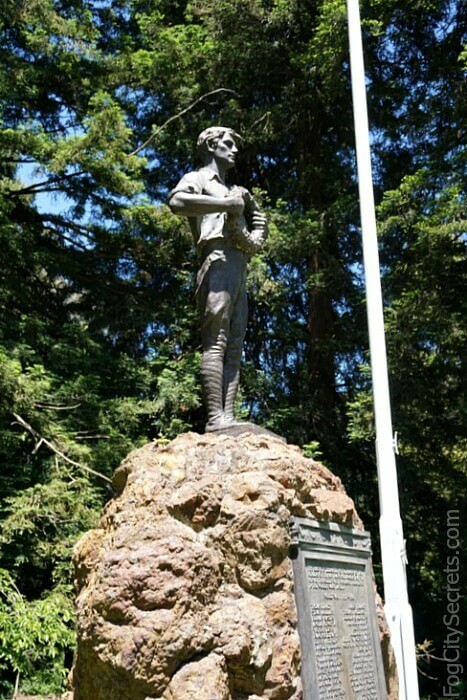 There's no sign, but the entrance is just left of Doughboy Meadow with its statue of a WWI soldier. 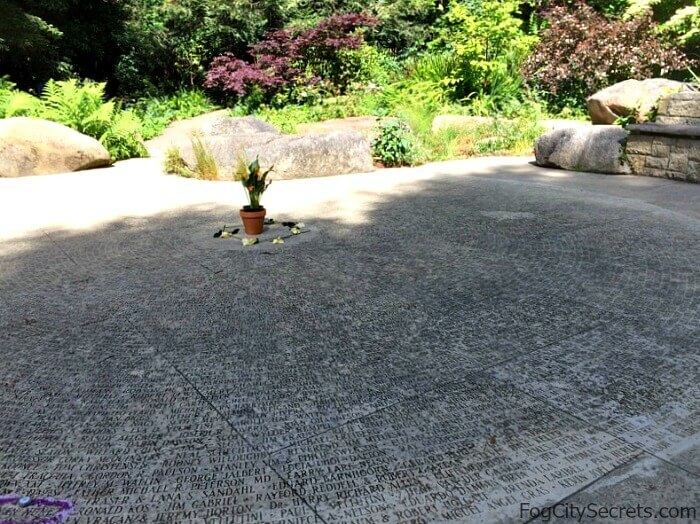 This 7-acre area of trees, flowers, rock and meadow was created in 1991 to provide a quiet place for those affected by the AIDS epidemic to reflect and remember those who have died. The Grove was designated a national memorial by an act of the U.S. Congress in 1996. 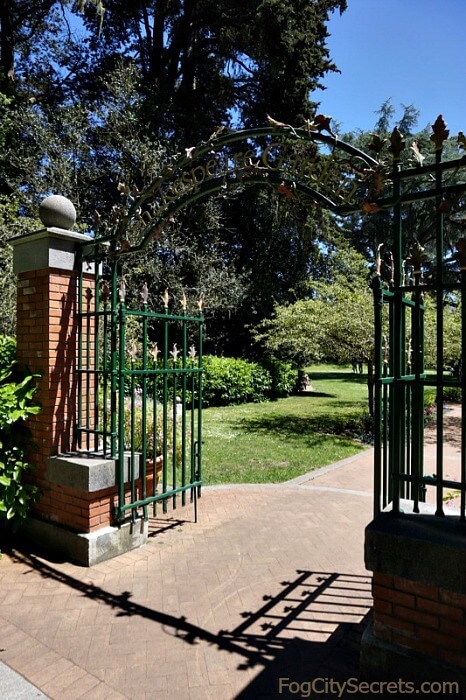 Formerly the Laveaga Dell, you'll find redwoods, dogwoods, Monterey Pines and Cypresses, as well as the Fern Grotto and many large stones with inscriptions. Benches are provided for seating along the paths. This garden winds some distance into the park. Near the main entrance is a stone circle, the Circle of Friends, with the names of hundreds of people affected by the epidemic engraved in it. Nearby, you'll find a serene stand of redwoods with a man-made stream bed running through it, and further on, a large open meadow. 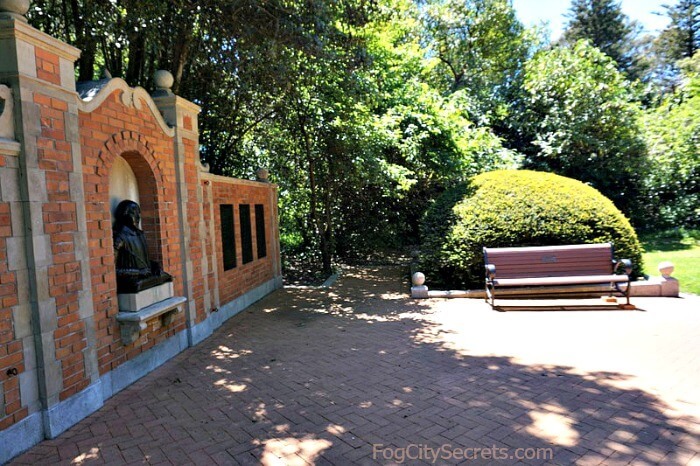 At the far end of the grassy field is the Fern Grotto, which pre-existed the AIDS memorial and was incorporated into it. A bubbling stone fountain sends water into a stony creek. All in all, this is a lovely place to wander, with quite a variety of environments to explore. It's surprisingly large given its inconspicuous entry points on Bowling Green Drive and Nancy Pelosi Drive. There is a self-guided tour available via smart phone, with signs explaining how to access it. Also, free, guided tours of the Grove are conducted the third Saturday of each month, March through October, from 9 am to 12 pm. 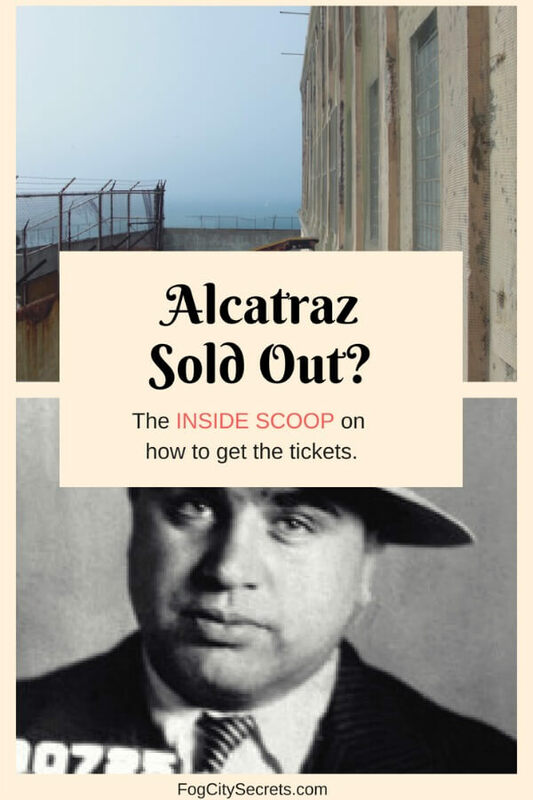 (Call 415) 750-8340 for more info, or visit aidsmemorial.org. The Lily Pond is a huge, marshy pond across Nancy Pelosi Drive from the AIDS Memorial. At the moment, the lily pads are scarce and it's not particularly attractive, but it is big. There's a much better-looking one in the Conservatory of Flowers. But wait, there's more! 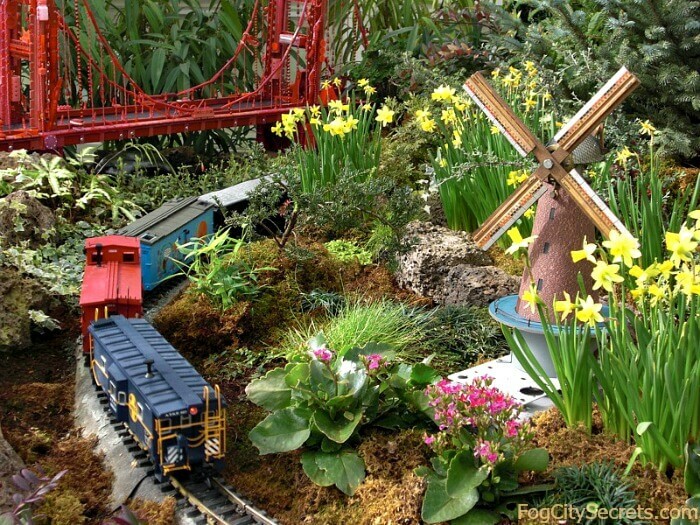 See everything Golden Gate Park has to offer.